Hey friends! Sorry for the lack of outfit posts recently... my little family has just been passing sickness around to each other and we've been down for the count this week. But everyone seems to be doing a little better today! If you're any sort of shopaholic like me, you know that budgets are a MUST if you don't want to overspend. It's soooo easy to just buy things because they're on sale, or for a special event, or because you're out shopping with your friends and you see something that has to go in your closet. I'm guilty of all of those, but I've learned to rein myself in a little and make more wise shopping decisions. That's not to say that I don't make plenty of shopping mistakes... because I do. I have a budget, but sometimes I spend beyond it. My issue is that shopping is therapeutic for me so if I'm having a bad/stressful/challenging day, I just want to go shop and buy myself a few things. I've learned though, that having a budget makes everything so much easier. I make wiser choices when I shop, and I don't have to feel guilty if I need to take a therapeutic shopping trip every now and again! As long as I'm within my budget. If you don't already having a clothing budget, try looking at your current spending to get an idea. If the average amount you're already spending is a reasonable amount, set that as your budget! 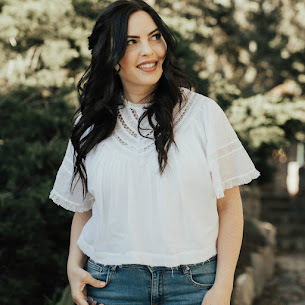 Or, if you're realizing that you're spending too high of a percentage on clothing, cut back to reasonable amount and set that as your monthly (or quarterly, or yearly) budget. I'm trying something new this month... I'm going to show you what I spent my money on! I'm not trying to be in your face about what I'm buying... I just want to hold myself accountable for what I spend my money on AND I want to be real for you about budgeting, spending, etc. Here's how I spent my budget of $200 for February this year! This month was awesome because I got a lot of the things that I've been eyeing for a while for a much lower price! Every single thing I bought this month was on sale, which is pretty great. Nothing I purchased was an impulse buy, so I feel good about what my money got me this month. I feel like everything I got is pretty versatile and will be well worn! The dress I purchased specifically for our Hawaii trip in a few months, because I plan on living in breezy dresses and swimsuits. But, it can be dressed up and worn to church on Sunday as well! I hope to show you where my budget money went each month, is that something you're interested in seeing? I'd love to know! 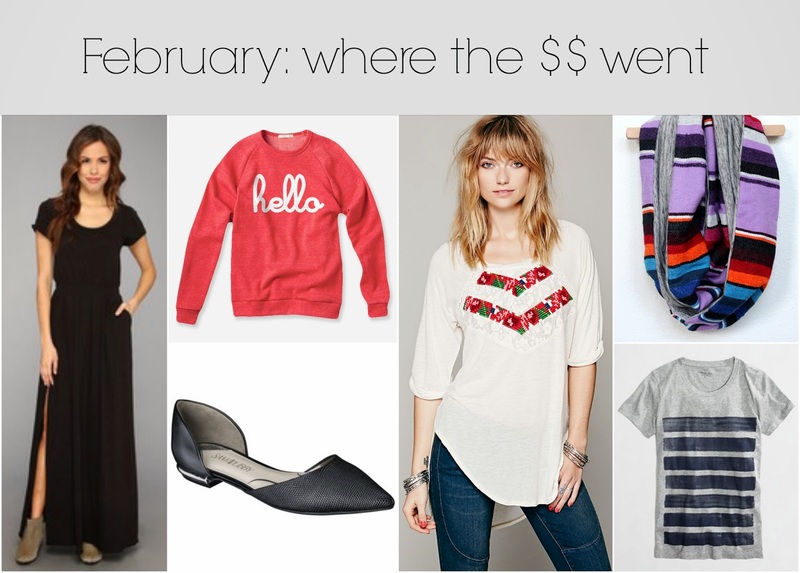 How did your month go, budget-wise? Love that Free People top with the roses. Love that scar and J Crew Factory Tee! Setting a budget for shopping is a great idea, I need to start doing it. You got a lot for your money, great finds! Congrats on the great deals. I love everything you got! I just ordered those d'orsay flats in the snake print! I'm a fellow budgeting blogger, so I love seeing what everyone else scored :) Good luck with March! That hello sweatshirt is so ADORABLE! And those flats look super chic! I love that sweatshirt! I'm new to the shopping budget thing, so its been really interesting to see what happens when I put myself on one. So far I've done really well (only went over by $20 once), but I've had to be a lot more careful about what I buy. Limiting spending does take away my option to emotionally shop, so I've had to find other things to do when I'm having a bad day. I think that it is awesome that you posted something like this. Makes me feel like I can actually have cute clothes without spending a fortune. Really a good resource, keep them coming!